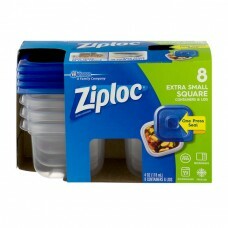 Ziploc® One Press Seal Extra Small Square. SC Johnson. A family company. Brand containers. 8 extra small square containers & lids. BPA free. Microwave. Dishwasher. Freezer. 4 oz (118ml). 8 containers & lids. Save space in your fridge. Save space in your cabinets. Ziploc® containers with one press seal: Designed to snap closed with one simple press on the lid, these containers save space by nesting in cabinets and stacking in the fridge. Extra small square (0.5 cups). Small rectangle (1 cup). Medium rectangle (1.8 cups). Medium round (3.5 cups). Small square (3 cups). Medium square (5 cups). Large rectangle (9 cups). Large round (6 cups). Ziploc® Twist 'N Loc® containers: Leak-resistant seal is perfect for liquids. Small twist 'n Loc® (2 cups). Medium Twist 'n Loc® (4 cups). Environmental facts: These #5 plastic containers and lids are recyclable in a limited but growing number of communities. Please recycle this paperboard carton. Product not formulated with BPA (Bisphenol A). A family company since 1886. Learn more at: www.scjohnson.com. Carton made with 100% recycled paperboard™. Minimum 35% post consumer content. Paper-box. Rinse before recycling. Check locally*. Plastic. Container & lid. *Not recycled in all communities. how2recycle.info. Questions? Comments? Call 800-558-5252 or write Helen Johnson. Visit us at www.ziploc.com. ©2016 S.C. Johnson & Son, Inc.